There's a maple tree in my backyard. We don't have too many maples around this area and because of the temperatures this one never shows the gorgeous colors that maples are famous for, but the shape of the leaves are lovely anyway. 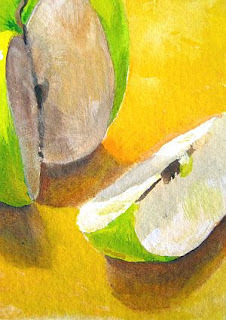 This one is on buttercup yellow Pastelmat. I painted the pale yellow over that ground, but it definitely flavored the colors in the painting. Yes, if it looks familiar, you're right! It's from a view I see quite often, and I have a photo that always intrigues me, so I used it again. The delicate sunrise colors please me. I wanted the mesa and that lacy tree to have enough detail to satisfy, but not become distractingly busy. I painted the details there and then added a wash over the top to unify the whole thing, then picked out a few more details again. I also used a fun technique on the backlit trees. I painted them in medium-dark green, then added the dark at the bottom and used a shader brush to integrate it. Once that was dry I added the light and did essentially the same thing, allowing the lights to dry every so slightly more to allow it to stay bright and not so blended. Hope some of you will join me for coffee and a look at my new little book. I just wanted to show you the scale of it. You can see a preview of it by clicking here. Enlarge it on your monitor using the small View Screen box in the lower right-hand corner when you get there. Blurb will ship to lots of places outside the US. Check here to see if it's delivered to your area. I've mentioned the book I recently designed a time or two on the blog and today it arrived. I have to say that I'm impressed. It's quite a nice little softcover book. 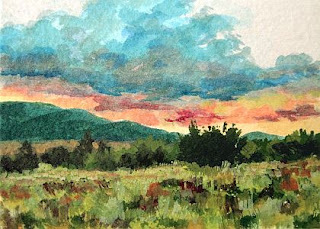 I included 68 paintings and three step-by-step demonstrations, as well as the text of the article that was in Watercolor Artist magazine in February, called Emergency Inspiration Kit. 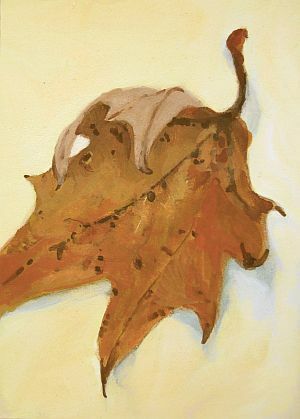 I've had a lot of paintings shown in magazines, due to my association as a writer for The Pastel Journal, The Artist's Magazine, and Watercolor Artist over the last 12 years, so I was a bit skeptical about the quality that an online publisher such as Blurb could produce. I worked hard to lay it out so that the paintings are life-sized, and they are. The book itself is only 7" x 7" in size. The intimacy of this scale is well suited to showcasing these 2.5" x 3.5" paintings. 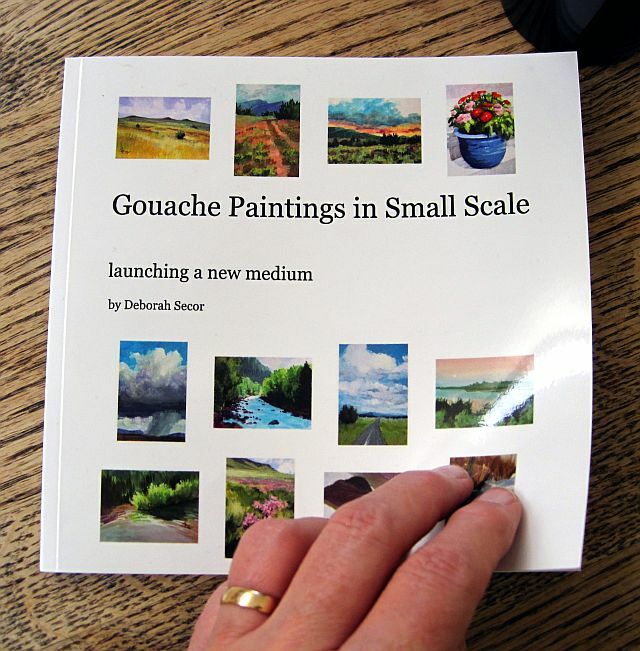 So let me reiterate that although this is not a big, impressive book, it is a very nice little collection of photographs that pretty accurately represents my paintings, and I'm most pleased with it. I'm quite happy to offer it for sale to anyone who is interested. I kept the price modest, of course, and you can preview every page, so you'll know what you're getting. 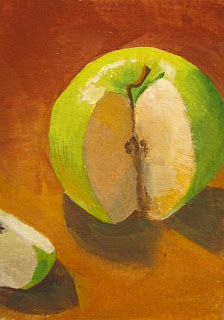 In contrast to the last post, this apple seems lost and sad, as if a part of him is missing... Okay, I admit that maybe I'm carrying this anthropomorphism a little too far. I enjoy the palette in this painting. The warm rusts enhance the cool yellow-greens nicely, and give some emphasis to the sliced areas that are lighter in value. It's also on Arches 300 lb. cold-pressed paper. I can't help it--apples just seem like they're people. It must be the roundness that makes me think of a head or body. This one looks like he's showing off as he stands in the spotlight. I almost expect him to toss out his arms to each side as he looks up into the light... Trust me, on the other side this little guy had a big grin! I found it tough to compose with a single round object, but I believe this one works. The shadow helps, and I love the glisten. On Arches 300 lb. cold press paper. A small orchard in the hills near Santa Fe, Dixon Apple Farm, is famous for its Champagne Apples. I became the happy possessor of one bag full of these beauties and have been enjoying the delight of an apple a day (at least), and anticipate baked apples for dessert tonight. In the last few days, I've been painting them, too. Apples aren't easy. They're so iconic. So simple. So round. And you know most people expect an apple to be red. I cast a strong light on one, overlapped a few others, raised one up and then looked down on it. I even played with a starry sky behind one. I have six next to my elbow, and of the lot this is the only one I'm willing to share right now! But this one finally hit it for me... 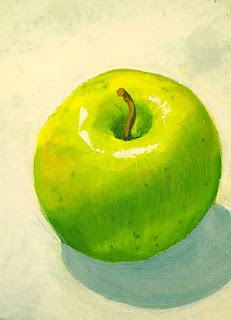 The orange-yellow made the greenish-yellow apple snap. The shadows behaved themselves. And the slice beamed up, creating a nice area of much needed contrast and some interesting shapes. The only problem is, my subject matter is almost all gone now!I can't resist them. I've become more and more intrigued with using watercolor techniques for the sky, just letting the paint do what it does when wet. 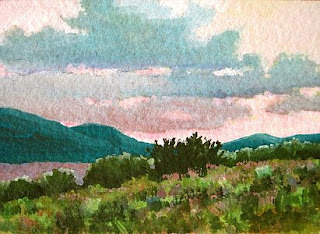 I used a wet-in-wet layer first, let it dry and then added slightly more opaque paint over that to create the successive cloud banks. I used more opaque gouache (less water, more paint) for the mountains and foreground. I like the way this has worked, plus I love the colors in this one. It's on Arches 300 lb. cold press. Normally these are for sale, but this one is free. All you have to do is leave a comment on this post, including your name, before Friday, October 10, at midnight (Mountain Standard Time), and I will randomly choose one to receive this little painting over the weekend, and post the results on Monday, October 11. I would love to send it to you as a perfectly free little gift. From my ♥ to yours! All that glitters isn't gold? Christmas comes but once a year? This fun painting is on Arches 300 lb. cold press, and was painted from a photo I took years ago when I lived in the mountains. 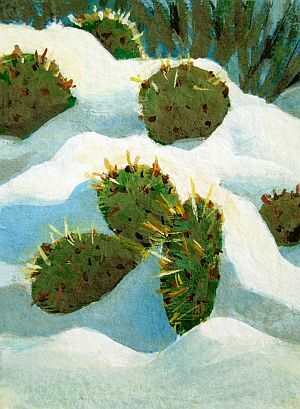 We saw prickly pears in snow regularly up at 7,000 feet in the Sandias. It always amused me, since you don't think of cactus and snow together. I like the contrasts of prickly and smooth, too. I've also started on a project that might interest you. I decided to make a book of these little gouache miniatures, in order to have a good portion of the collection in one place. I'm using Blurb, and it's not finished yet, but once it is I might offer a few copies here if anyone is interested. It's a softback book, and the number of pages is yet to be finalized, which will determine the price. I'll have to finalize things and get a copy to see if it looks as good as I hope, and then I'll let you know... I'm including three step-by-step photo demos there, and the article (in part) that was in Watercolor Artist in February. I hope it might be a nice little book. Time will tell!